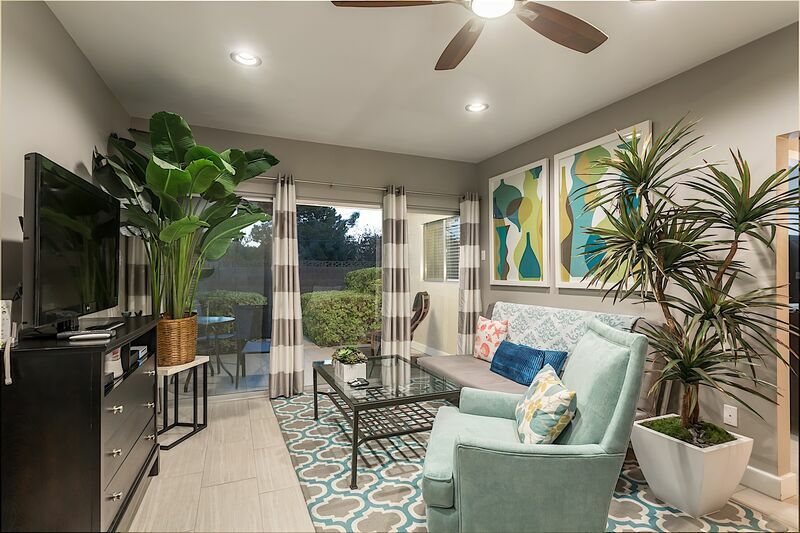 Welcome to Arcadia Hideaway ~ Fabulous 1 BR, 1BA gem in the heart of Scottsdale! Arcadia Hideaway is a ground floor condo located in perfect proximity to both the Arcadia neighborhood and Old Town Scottsdale. This perfect location has bike and running paths right out your door. The light and bright space has ceramic tile floors, high ceilings, updated interiors and a wonderful outdoor space to enjoy. The relaxing living room offers a comfortable futon couch, perfect for overnight visitors. This space also offers an entertainment center with a 42 inch flat screen TV, Nintendo Wii2, Google Chromcast, WiFi, and cable television. There is also a desk/workspace in this great room area. The kitchen has been recently updated and features brand new stainless steel appliances, gas stove/oven, built in microwave and track lighting. This cozy condo has a small dining space for up to three guests. The bedroom has tile floors, a queen bed, two-nightstands with reading lamps and a ceiling fan with lighting. The matching eight-drawer dresser across from the bed has a 37-Inch TV sitting on top so you can enjoy your programs from the bedroom. The bathroom has is also newly remodeled with modern fixtures, tile floors and a custom walk-in shower. Adjacent to the bathroom is the laundry closet with a full-size washer and dryer. Outside the living room door is the spacious covered patio with a table for two. This space has a motorized screen door that can be used to block the sun and/or for extra comfort and security. In the center of the community are the two community pools.